Today is a great day. One of my absolute favorite U.S. men’s figure skaters has announced his return to competition. My immense appreciation for his skating talents has been well-documented on this little blog, so it is probably a big understatement to say that I am thrilled. He initially retired over the summer, after a string of concussions made it unsafe for him to continue training. But, according to Ice Network, he has been cleared by his doctors and is back on the ice, ready to finish his career on his own terms. I know Nathan Chen is the quad king for the U.S. right now, but Josh’s return adds an interesting new dimension to the U.S. men’s field. He told Ice Network very confidently that he will come back with a quad or two in his arsenal. If he returns to his prior form, as far as the spins, footwork, and artistry are concerned, and then adds some quads—it could be a real fight between him and his fellow artists, Adam Rippon and Jason Brown, for the remaining spots on the Olympic team (barring an injury or some sort of bizarre disaster that would keep Chen from PyeongChang). Categories: 2015 U.S. Nationals, 2016-17 Season, U.S. Nationals | Tags: Joshua Farris | Permalink. 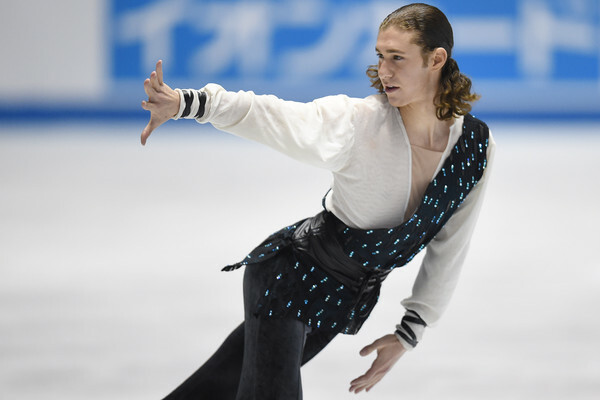 After the U.S. Championships and heading into Worlds this year, all the talk was about U.S. skater Jason Brown’s lack of a quad. Chicago Tribune columnist Phillip Hersh was skeptical that Brown could take on the top guys in the world without it. USA Today columnist Christine Brennan thought the US judges were inflating their scores too much and setting their skaters up for failure on the world stage. I threw my two cents in and agreed with Brennan, saying it seemed like Brown was over-rewarded at Nationals. I think it’s safe to say that all three of us were wrong. Brown took 4th place at Worlds and then set a record at the World Team Trophy, earning the highest-ever international score by a U.S. man. All without that oft-talked about quad. How does he do it? Attention to detail. He racks up the points in the International Judging System (IJS) with intricate transitions and jump entrances, as well as difficult spin positions that he is able to perform at incredible speeds. And the jumps he does do are usually clean; no under rotations or scratchy landings, which usually earns him positive grades of execution on plenty of elements. All those points add up, sometimes more so than one 13-point quad will. Especially against guys who get rattled after missing a quad and skate poorly through the rest of the program. Brown’s adeptness at collecting points reminds me of his fellow Chicagoan, Evan Lysacek. Lysacek was able to work the point system so well that he leapt from 10th after the short to 4th overall at the 2006 Olympics and won the gold medal at the 2010 Games ahead of Evegni Plushenko’s quads. Brennan’s argument that Brown’s Nationals scores were inflated is not entirely without merit. The 30-point difference is significant, but all U.S. Nationals scores are inflated compared to international scores. In international competition, seven judges’ marks count towards the score; nine judges are used at U.S. events. Combine that with a bit of the inflation Brennan was talking about, and I think it’s easy to account for those 30 points. The IJS definitely has its quirks and weaknesses (I have enough thoughts on this for a whole other post), but those who study it and work it like Brown does are the ones that will have the most success. And despite the shortcomings of the IJS, it is great how the system encourages skaters to use unique entrances and transitions throughout their programs. Yuzuru Hanyu’s triple axel entrance from his short program at the 2014 Olympics and Evan Lysacek’s 2006 Olympic long program are two of my favorite examples of these types of innovative transitions. This isn’t to say that Brown won’t need the quad eventually. His best-ever score by a U.S. man ranks 31st all-time in the IJS, behind the likes of quad kings Javier Fernandez of Spain, Patrick Chan of Canada, and Japanese Olympic Champion Yuzuru Hanyu. But if Brown can do all this without the quad, imagine the numbers once he has it in his arsenal. The quad game is definitely ongoing, and we might have spoken a bit too soon in writing off Brown’s international chances. Here’s hoping he masters the quad over the summer, but even if he doesn’t, I think we’ve learned it’s not wise to count Brown out. Categories: 2015 U.S. Nationals, 2015 World Championships, 2015 Worlds, analysis | Tags: 2015 U.S. Nationals, 2015 World Team Trophy, 2015 Worlds, 2015 WTT, Evan Lysacek, figure skating, Jason Brown, quads, Yuzuru Hanyu | Permalink.